DVD film of the interior of Iain MacKinnon’s (Iain Chaluim) thatched house at Kilmoluaig in 1997. Iain Chaluim is seated by his hearth speaking with Iain Patterson, East Linton, while the camera pans the inside of the house, focusing on a variety of objects: medicines, tea caddies, photo of a baby, the range, glassware, wall clock, crockery, the interior of the porch. 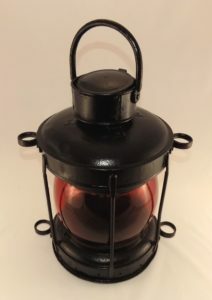 Furniture and a gas cooker, radio and kerosene lamp are also visible. The sound is muffled although Iain Chaluim can be heard to say “I don’t think Dr Holliday approves…very nice man”, then both Iain’s prepare roll-up cigarettes. 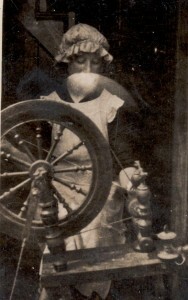 Another unidentified crofter is present briefly at the start of the film. (5 minutes). Cutting from the Glasgow Herald about a task force set up by Argyll & Bute Council to help improve the living conditions in 14 houses on Tiree through restoration and modernisation. 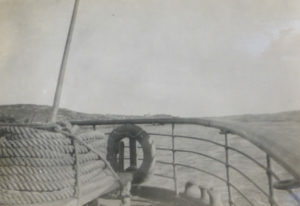 Features photographs of John MacKinnon, Kilmoluaig, and of Alastair MacDonald and his neice Rena. Includes photocopies of original. Black and white photograph of Iain MacKinnon of Kilmoluaig. 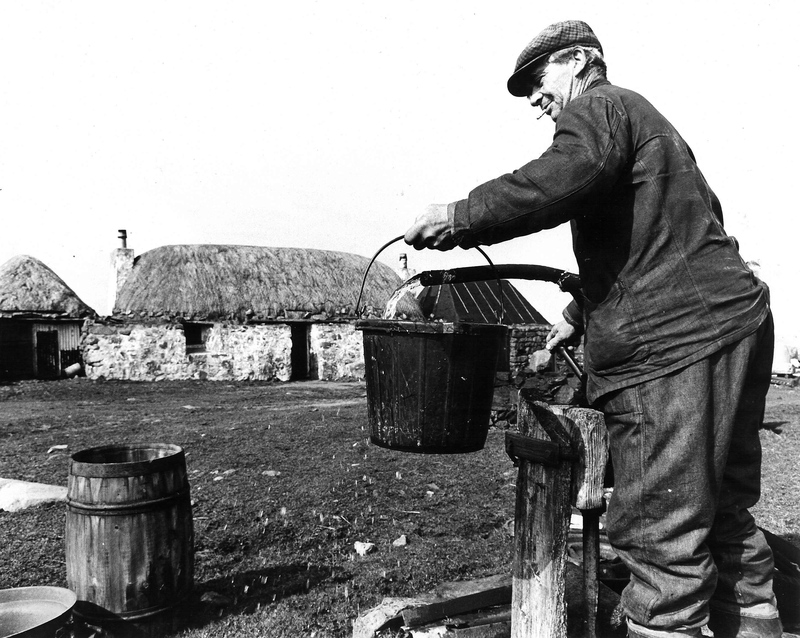 Iain MacKinnon (Iain Chaluim) drawing water from the well at his croft in Kilmoluaig. 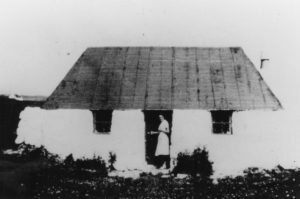 Black and white photograph of Iain MacKinnon`s croft house in Kilmoluaig. 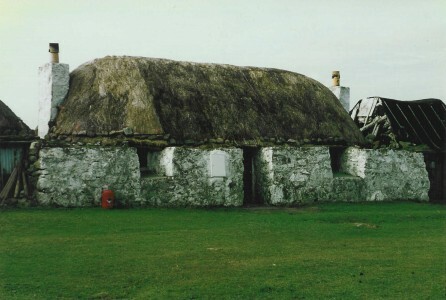 The thatched house of Iain MacKinnon (Iain Chaluim) in Kilmoluaig. 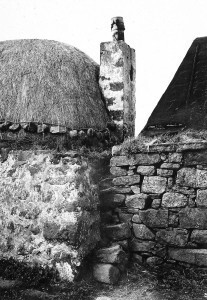 Chimney detail of Iain MacKinnon`s (Iain Chaluim) thatched house in Kilmoluaig. 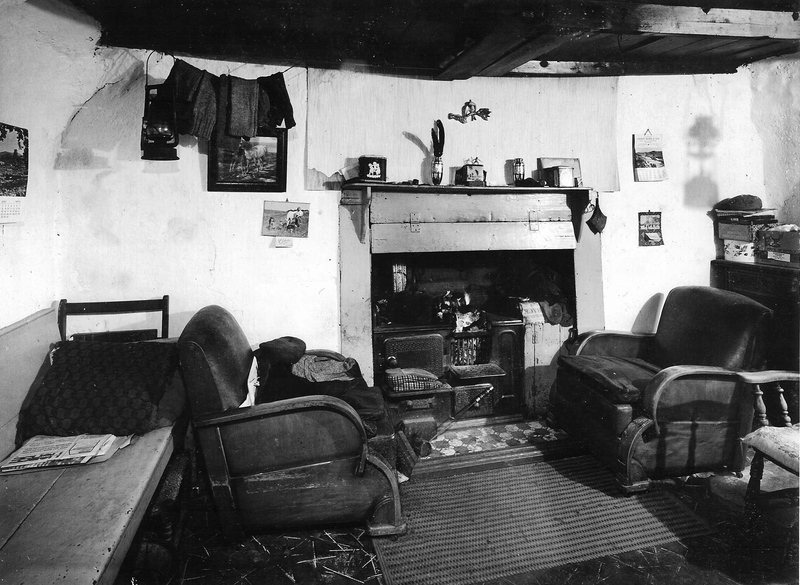 Black and white photograph of the interior of Iain MacKinnon`s croft house in Kilmoluaig. 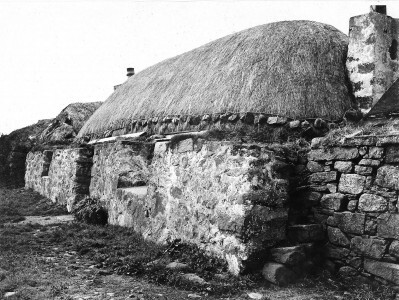 The interior of Iain MacKinnon`s (Iain Chaluim) thatched house in Kilmoluaig. Iain lived there all his life, as he preferred it, without mains water or electricity. 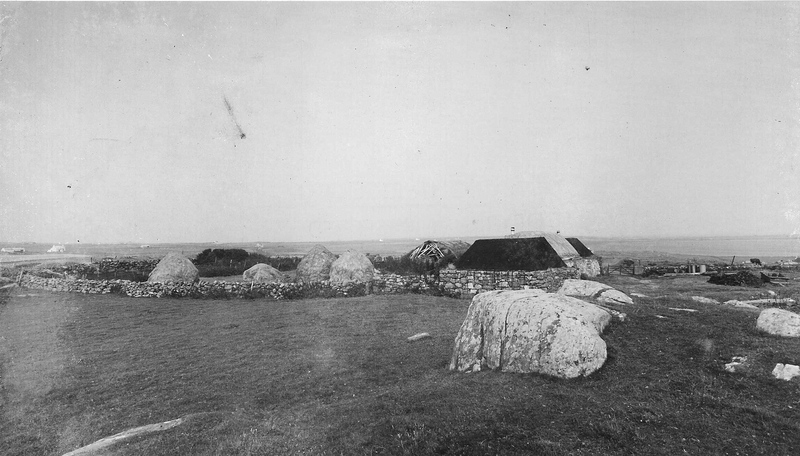 Black and white photograph of Iain MacKinnon`s croft in Kilmoluaig. The thatched house, outbuildings and stackyard at Iain MacKinnon`s (Iain Chaluim) croft in Kilmoluaig. Colour photograph of Iain MacKinnon`s croft house in Kilmoluaig. Iain MacKinnon`s (Iain Chaluim) thatched house in Kilmoluaig. 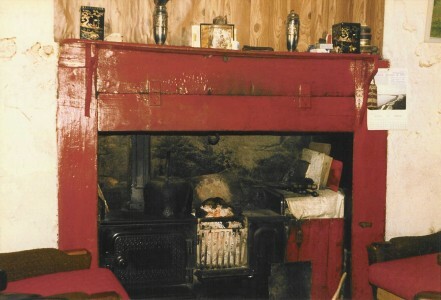 Colour photograph of the interior of Iain MacKinnon`s croft house in Kilmoluaig. The fireplace and range in Iain MacKinnon`s (Iain Chaluim) thatched house in Kilmoluaig.